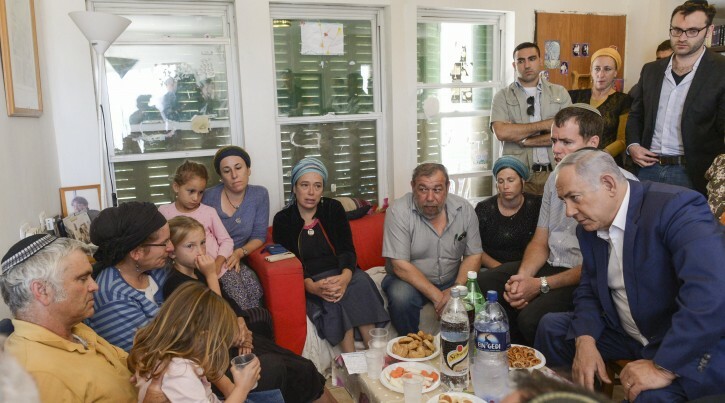 Jerusalem - Prime Minister Benjamin Netanyahu on Friday visited the family of 13-year-old Hallel Yaffa Ariel, who was murdered Thursday morning as she slept in her Kiryat Arba bedroom after a terrorist from a nearby Palestinian village sneaked inside and stabbed her to death. During the meeting, Netanyahu commended the family’s strength during such a difficult time, and promised to discuss with Liberman ways to help prevent similar attacks in the future. “We will stregthen together here,” Netanyahu told the family. “I will sit with the defense minister and we will decide how to strengthen this community,” he added. Say what you will- there is no political solution to this sort of hate-fueled violence.We can only aid the family with the resolve of the left and the right to become one.Hevron is Tel Aviv, Lakewood is Lawrence and Paris is Boro Park. Our enemies believe that a Jew is a Jew.We should treat each other that way and invoke H-shem's rachamim. Umocheh H-shem dimah me-al kol panim. ELIMINATE ABU MAZEN who is the instigator of this bloodshed. Nice words, however ACTIONS are what count, BIBI has put a soldier on trial for killing an armed terrorist in the very Chevron where this girl was murdered, BIBI has given back the bodies of EVERY terrorist in the last year despite saying he wont, BIBI opposes the death penalty, which even for a jihadist is a deterent as they will no longer be used as bait for DEAD soldiers, which by the way has yet to retrieve from GAZA, BIBI has apologized and given 21 MILLION DOLLARS to Turkey 2 days before this child was killed. There is a political solution. Rabbi Meir Kahane had the solution. We are suffering today because we didn't listen to him. Bibi has become too soft in his old age. Time is now for major retribution. Absolutely right! But when a courageous person stands up and says the truth, which sounds politically incorrect, he is never listened to! That's why we must elect Trump! He's the only courageous one of our time who isn't afraid to name the enemy and vow to destroy them! Exactly. How soon before we can vote this weakling out?